One-Pot Vegetarian Pasta Primavera Recipe from Oh My Veggies! I’m totally a sucker for one-pot meals. I mean, fewer dishes? Less fuss and muss (whatever “muss” is)? I’m in. So when I saw one-pot pasta floating around Pinterest awhile back, I was intrigued. I made Martha Stewart’s version pretty much immediately, and I loved it. And, because I’m a food blogger and this is what I do, I tweaked and fiddled. This One-Pot Pasta Primavera is one of my favorite outcomes so far. I love the concept of one-pot pasta. Essentially, you put all the ingredients into the pot, including the uncooked pasta and water (or broth). And then you cook, tossing constantly, for several minutes, until most of the liquid has cooked off and the pasta and accompanying veggies are tender, perfect, and saucy. This One-Pot Pasta Primavera is perfect for spring. With tender asparagus tips, broccoli florets, and a smattering of peas, it’s got lots of green to go around. Onions, mushrooms, garlic, and parsley add a little more oomph and flavor. True to classic Pasta Primavera form, we make it a tad creamy by ending with a bit of cream (just a splash!) and a sprinkle of grated Parmesan. Use a heavy, roomy pot. There will be lots of stirring and tossing. If you have them, use long-handled tongs. Short handles keep you a little too close to the heat. Ouch! Select a dried pasta that has a cooking time of between 9-11 minutes. Otherwise, you may end up with under-cooked pasta, or worse, mushy mush. Once it starts boiling, be sure to toss and stir constantly! Otherwise the pasta will start sticking, and clean-up might make you sad. This post was originally published on March 17, 2014. This creamy, saucy pasta overflows with spring green veggies. But the best part is that it cooks up in a single pot–in just under 10 minutes! 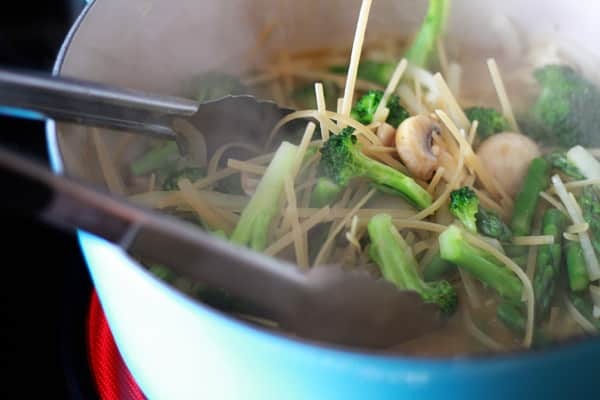 Add the broth, linguine, onion, broccoli, asparagus, mushrooms, garlic, red pepper flakes, salt and pepper to a large pot set over high heat. Drizzle the olive oil over the top. As soon as it comes to a boil, set the timer for 7 minutes and start tossing constantly with long-handled tongs. Continue boiling and tossing. As soon as the 7 minutes is up, add the peas, parsley, heavy whipping cream, Parmesan, and lemon zest and continue cooking, tossing constantly, for 1-2 more minutes, until the pasta and veggies appear tender. Remove from heat. So I am an awful cook, every recipe I follow step by step and it comes out terrible. Not this! I did everything exactly as instructions said, then cooked some chicken in a skillet and added it at the end. I wish it was creamier like a primavera at a restaurant, but its good enough. Definitely tastes like your typical primavera. I used Muellers protein noodles because theyre only made of whole grain and legumes, and have 20 g of protein per serving along with 8 grams of fiber to make it healthier. 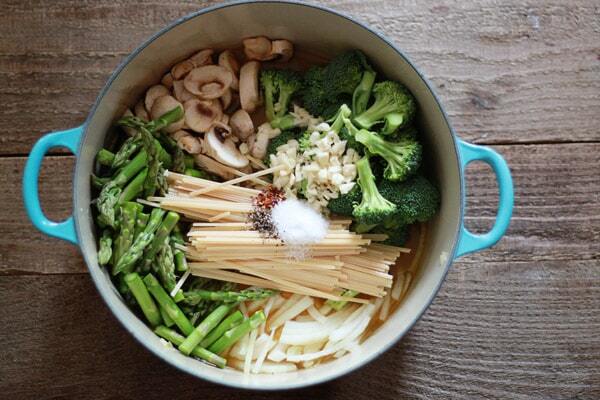 Wish I did the whole 8 ounces of mushrooms and maybe more broccoli, it just seems like a lot of noodle. But definitely not let down. We’re working on it, James. Hey Barb, we’re having some problems with the print button that we’re working on. Hopefully it’ll be sorted out ASAP! This looks so yummy and a great way to get tons of veggies! Loved this! Can’t wait to have it again for lunches this week!